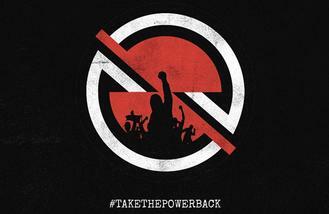 A post made on the official Twitter account of the American rock band - comprised of Zack de la Rocha, Tom Morello, Tim Commerford and Brad Wilk - has revealed a new piece of artwork and the address for a website prophetsorrage.com and hashtag "#TakeThePowerBack". The website shows a timer which is counting down to June 1 and fans can type in their email address to receive the announcement. The same message and artwork has also been spotted on posters placed around Los Angeles. The hashtag is the name of a RATM song, which featured on their 1992 self-titled debut album, and fans have been quick to point out online that 'Prophets of Rage' is the name of a Public Enemy song. Recently, Public Enemy's Chuck D has been sharing clips of Rage Against The Machine live performances on his Twitter account, prompting fans to speculate the two acts could be heading out on tour together. Rage Against The Machine have not played live together since 2011 and they have not released a studio album since 2000's 'Renegades'. Last year, bass player Commerford hinted a return to the stage could be in the foursome's future. He said: "We are still a band, and we still might play again. We don't have anything scheduled right now, but you never know what the future will bring."